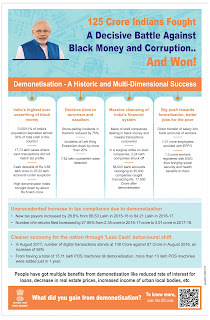 Calling demonetization a “historic and multi-dimensional success” on its first anniversary, Prime Minister Narendra Modi congratulated 125 crore Indians for fighting, and winning, a decisive battle against black money. In another tweet, he attached a 7-minute documentary film, showcasing him as the harbinger of a new era in a corruption-ridden India, and benefitting the poor and punishing the corrupt rich. In the video, the PM said that when he became the PM, the country was in a dire state due to corruption and black money. He called demonetisation a step that was never taken before or even thought of in the independent India. In yet another tweet, the PM asked the countrymen to share feedback on demonetisation on NMApp. “People have received multiple benefits from demonetization, such as a reduced rate of interest for loans, a decrease in real estate prices, increased income of urban local bodies, and so on,” he said. In a slide posted on Twitter, Modi called the move a “decisive blow to terrorism and Naxalism”. He claimed that stone-pelting incidents in Kashmir have come down by 75 per cent and incidents related to the Left Wing Extremism were down by 20 per cent. He further noted that as many as 7.62 lakh counterfeit notes have been detected, so far. 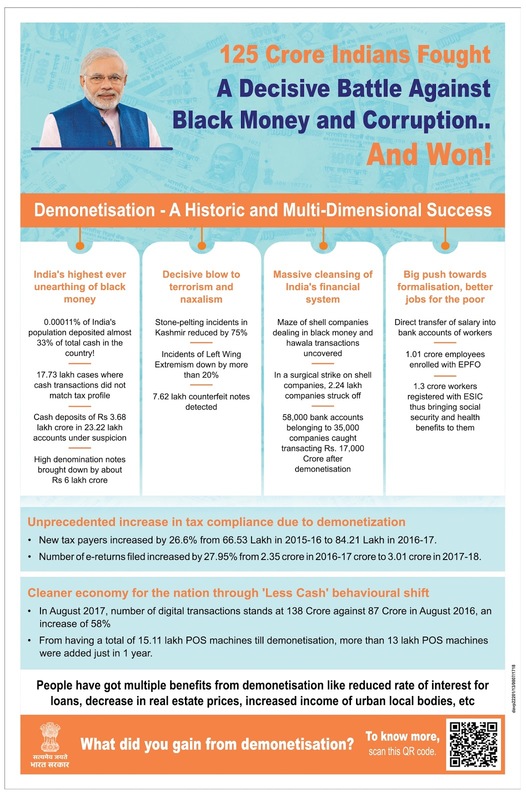 Toeing his line, BJP leaders, including many Union ministers, also enumerated the “benefits” of demonetization, claiming that the move exposed black money, forged a more digitised economy, and widened the tax base. Union minister Nitin Gadkari said the decision led to 58 per cent growth in digital transactions and an increase in the number of taxpayers. The Centre’s scrapping of old Rs.500 and Rs.1,000 notes on November 8, last year, hurt those who had black money, he added.